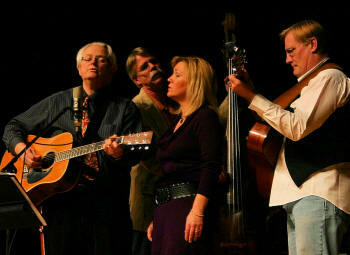 East of Westreville is a musical concert is based on folk, bluegrass, gospel, country, and roots music of rural America. Kaija Bonde is on vocals, with Boyd Bristow and Brian Bonde on guitars and vocals. Al Slaathaug is on bass. For our show schedule, click here. "East of Westreville" is a talented band featuring Boyd Bristow (Acoustic Christmas) on lead acoustic guitar and vocals, Brian Bonde (The Cardigans) on rhythm acoustic guitar and vocals, Kaija Bonde (Always…Patsy Cline) on vocals, and Al Slaathaug on string bass and vocals. 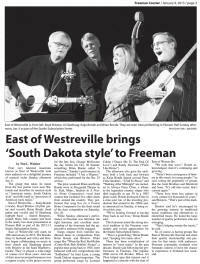 To listen to East of Westreville, click here. An "EOW" show intertwines good "old-timey" music with homespun humor, and an occasional special guest. It's an ever-changing mix of music and memories, reminiscent of the days when all that was needed for entertainment was a Philco radio and a comfy chair. To listen to East of Westreville, click here. 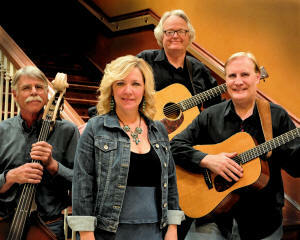 Here is East of Westreville's recent appearance on The White Walls Sessions. 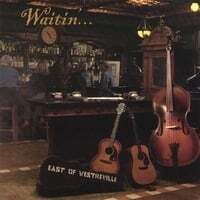 The East of Westreville CD "Waitin" is available! We are so pleased with the results and we think you'll love it! We were so honored to provide the music for Senator McGovern's prayer service at First United Methodist Church in Sioux Falls on Thursday, October 24. Vice President Joe Biden was present and shared remembrances. George was one of our greatest fans and a hero to all of us. Click here to view the prayer service on C-SPAN. Kaija and Brian Bonde were finalists in the A Prairie Home Companion Duet Contest! The national live radio broadcast was on October 20th from The Fitzgerald Theater in Saint Paul. Brian and Kaija were recently interviewed about the contest on South Dakota Public Radio: Click here to listen to the interview or to watch the KELO-TV news story click here. If you would like to bring one of our acts to your community or event, please contact us by clicking here. 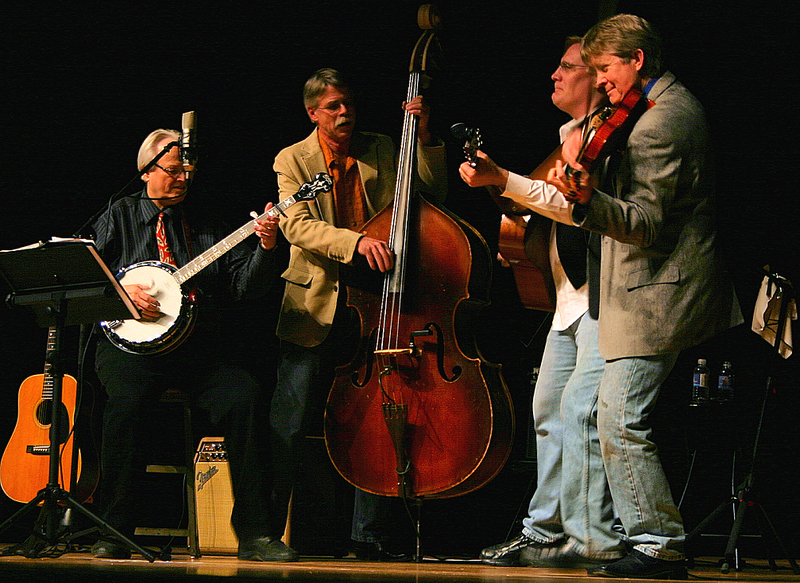 South Dakota Public Television recently broadcast an hour with East of Westreville on "No Cover, No Minimum." You can watch it all by clicking here. 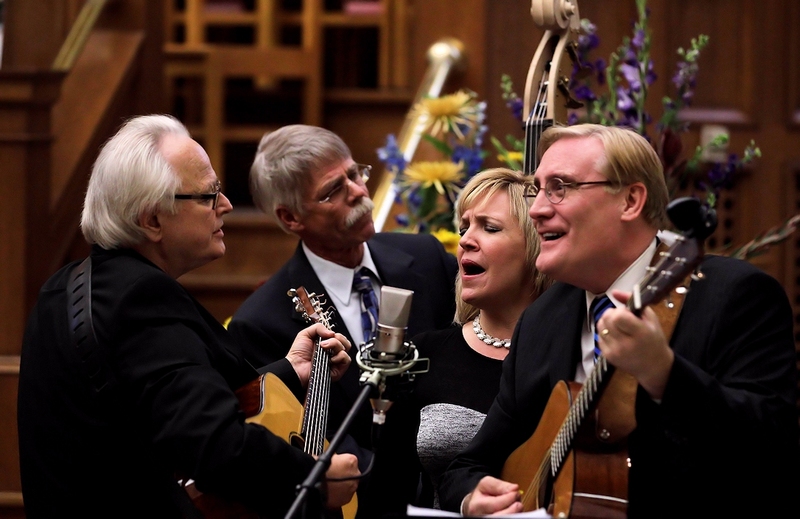 "East of Westreville" recorded the "No Cover, No Minimum" TV special for South Dakota Public Broadcasting. Everything went very well! We want thank Kevin and the whole gang at SDPB for making the taping so easy. We also want to thank everyone who joined us in the studio audience for making it so fun. They recorded about a 75 minute show and did interviews. They put all those pieces together for what actually aired. Click here for a story about the taping. To see some video from the shoot, click here. Read Doug Wiken's blog about the show by clicking here. East of Westreville has performed many times with our friend and special guest Kenny Putnam. Click here to listen to a recent interview with Kenny Putnam about playing with East of Westreville. This is an edited version of a show that ran on South Dakota Public Radio. If you'd like to listen to the song "High Lonesome Sound" from featuring Boyd and Kenny, click here. We have always included old friends with "EOW" and this collaboration has turned out to be something special. If you would like to bring this terrific act to your community or event, please contact us by clicking here. Rev. Dar Berkenpas of Sioux Falls, SD for the use of their photographs on this site.